You've got to be just a little bit jealous of Arjen (Ayreon) Lucassen; he gets to spend his days creating music he loves with some of the best musicians he can recruit. He's prolific, consistent, and has a gift of developing a project around a strong core of talent. 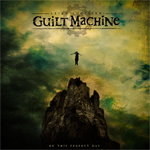 Lucassen's latest creation, Guilt Machine, is no exception to this. On a Perfect Day, a concept album which explores 'the destructive psychology of guilt, regret and the darkest form of secret - the secrets we hide from ourselves, is another sophisticated product of progressive music. Opposed to many past projects, Lucassen developed Guilt Machine without the diverse abundance of singers. Instead he choose Jasper Steverlinck of Belgian alt rock band Arid. His dreamy emotional Bono-like vocal style add much to Lucassen's often equally atmospheric and ethereal compositions. Also joining Lucassen are Chris Maitland (ex-Porcupine Tree)on drums and Lori Linstruth (ex-Stream of Passion) on lead guitar. Following his emotional lyrical content, the music of On a Perfect Day also sways away from the bombastic and symphonic arrangements of Lucassen's sci-fi-fantasy pieces. Certainly, the arrangements are sweeping and dense as on Green and Cream or Season of Denial. However, there's a noticeable ambient melancholy, noticeable throughout but most especially on Twisted Coil and Perfection, which reflects the exposition of guilt and regret as a debilitating quality. In the end, however, this On a Perfect Day is still prime and signature Arjen Lucassen. The prolific, and sometimes predictable, Arjen Lucassen throws us a curve with Guilt Machine's On a Perfect Day. A single lead vocalist preempts many guest stars, and melancholy and somber arrangements on a sober subject trump bombastic sci-fi tales. Expect different, but the same and you will still be delighted. Recommended! The prolific, and sometimes predictable, Arjen Lucassen throws us a curve with Guilt Machine's On a Perfect Day. A single lead vocalist preempts many guest stars, and melancholy and somber arrangements on a sober subject trump bombastic sci-fi tales. Expect different, but the same and you will still be delighted.